I decided this year that Katrina wasn't going to be a guest at my birthday this year. She was arrived on my 50th birthday August 29th 2005. I wasn't going to spend this hurricane season worrying about storms. June and July were uneventful and so was August until this week. 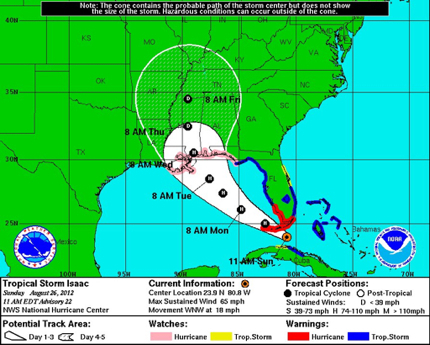 Hurricane Isaac is now in the Gulf of Mexico moving over the warm gulf waters building strength. Landfall is expected sometime late Tuesday or Wednesday. Exactly 7 years after Hurricane Katrina. A very unwelcome guest on this birthday. I got up this morning knowing we were going to be making plans to evacuate. We called and made hotel reservations in Texas. After watching the track of the storm I am hoping we are far enough west. New Orleans is now under a Hurricane watch. Louisania declared a state of emergency to prepare for the worst and hope for the best. I spent the morning picking up my beads and clearing off my bead table. It sits directily under the window. I packed a box of beads to take with me. I realized writing my morning pages how little I talked about Hurricane Katrina. We had already left town and were in Michigan watching the event unfold on TV. We arrived home 6 weeks later to unimaginable devastation. It forever changed my life and how I do things. I am ready. Things are packed and put away. Now we wait. The storm is 536 miles from the mouth of the Mississippi. So horrible for you to go through this again... I hope it will just go away and not hit any town badly...I am just hoping for the best outcome for all..you are in my thoughts. I wish you best best, Beverly. We're in the cone, too. We have been through a lot of storms in the last few years. Opal & Ivan are still bad memories. We don't live in New Orleans but a lot of our friends lost everything and we had some financial losses associated with the flood so, I understand the fears that have been rekindled. I hope it will go away !! recently passed south of Puerto Rico but just let a lot of rain. Luck!! Good luck. I'll be thinking about you. Oh, Bev, I really really do hope you do not have to go through this again. Wishing you the best. Stay safe. Oh, Bev, I am so sad for you. Mark and I actually went through Katrina, and I wondered about you at the time. I am glad you were away. You are so right, the devastation was horrible, and took a long, long time to heal. We decided, "Never again" so we moved, first to Dallas, and now to Phoenix. I will pray for you and New Orleans. I miss it deep in my heart every day. oh i sooo feel for you..living on the gulf this time of year is always nerve wracking ..hope you do not have to evacuate..will be praying this storm misses you and secondly doesn't do much damage to where ever it makes landfall. but if you must leave and are in houston ..call me. Thanks everyone for stopping by and the prayers. They are very much appreciated.